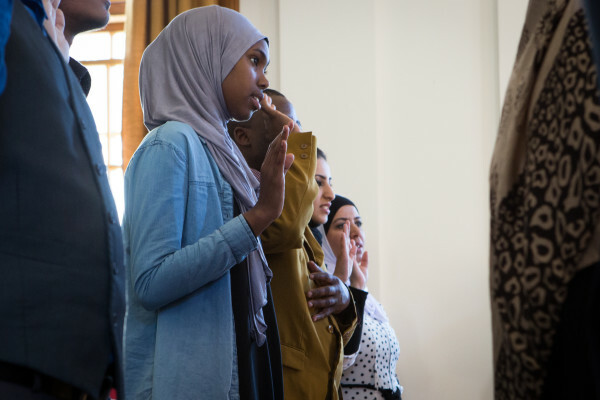 Refugees take an oath of allegiance on June 17, 2016, at City Hall in Portland as they become naturalized U.S. citizens. The Maine Department of Health and Human Services’ Office of Multicultural Affairs is located in this building in Portland. As President Donald Trump weighs sharp restrictions on the resettlement of refugees in the U.S., Gov. Paul LePage’s administration has been taking the final steps to end Maine state government’s small role in the federal refugee resettlement program. Documents reviewed by the BDN show that the state plans to end its part in the resettlement of refugees, who have fled war or persecution, on March 4. The full responsibility for resettling refugees and overseeing the federal money that comes into the state to pay for refugee services is expected to shift to Catholic Charities Maine, the nonprofit organization that currently works directly with newly arrived refugees. The March 4 end of the state’s role in refugee resettlement follows a November letter from LePage to former President Barack Obama indicating that Maine planned to end its participation in resettlement. The withdrawal does not mean refugees will stop coming to Maine, only that the state will play no part in overseeing their resettlement. The end of the state’s involvement means that the Maine Department of Health and Human Services’ Office of Multicultural Affairs will lose its core function. The future of the office, which started with a mission to help minorities and prevent discrimination, is unclear. A spokeswoman for DHHS did not answer questions from the BDN about whether the office would close. Documents recently posted to a state website, however, indicate the Office of Multicultural Affairs’ role in refugee resettlement will end on March 4, as will the office itself. 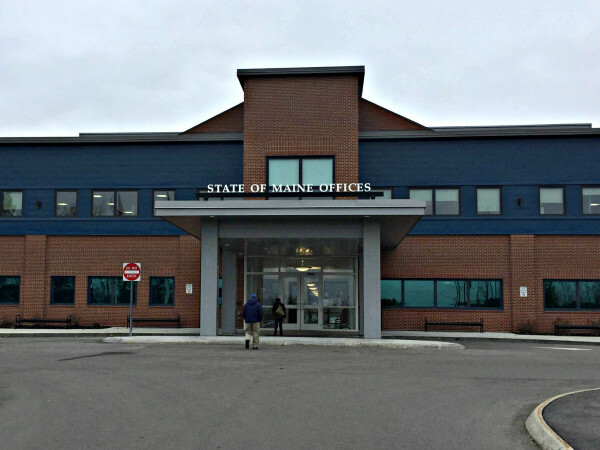 “[T]he Program and Office are coming to an end on 4 March, 2017,” stated one document published on the Maine Division of Purchases’ website as part of the state’s process to contract out services. It was signed by Sam Adolphsen, the chief operating officer of DHHS. Three other documents, also signed by Adolphsen and posted to the same website, refer to “services ending” after March 4. DHHS prepared the three documents to extend existing state contracts with Catholic Charities until March 4. “Maine’s official withdrawal from the refugee resettlement program becomes official on March 4th. The Department is working closely with the federal government to ensure a complete transition,” DHHS spokeswoman Samantha Edwards wrote in an email Jan. 17. Edwards declined to answer multiple questions posed about the future of the multicultural affairs office itself, what would happen to any office staff, and how any transition plan would prevent a lapse in services for refugees. The office’s primary job has been to disburse funds from the federal Office of Refugee Resettlement to Catholic Charities, the organization that directly supports the 200 to 600 refugees who arrive in the state each year. The office also ensures that Catholic Charities fulfills the responsibilities outlined in its contracts with the state. While ending Maine’s direct oversight of refugee resettlement doesn’t mean refugees will stop coming to the state, several people who work with immigrants said the state’s withdrawal would send a negative message about its desire to foster a welcoming, tolerant environment for Maine’s minority populations. LePage, meanwhile, has made his opposition to supporting refugees and immigrants clear for years. He has said asylum-seekers bring disease and the “ziki-fly,” made fun of Bulgarian and Indian immigrant workers, and sought to exclude both undocumented immigrants and asylum seekers from receiving state-funded public assistance. In November 2016, LePage announced that Maine would opt out of the federal refugee resettlement program. At the time, however, he gave no specifics about how he would withdraw support. “I have lost confidence in the federal government’s ability to safely and responsibly run the refugee program and no longer want the state of Maine associated with that shortcoming,” LePage wrote in a Nov. 4, 2016, letter to Obama. The federal government requires 120 days notice before a state can end its involvement in the U.S. refugee resettlement program. LePage’s letter is dated Nov. 4, 2016, precisely 120 days before March 4. Maine became the fourth state last year to announce it would withdraw from the refugee resettlement program, following Kansas, Texas and New Jersey. Those who pushed for the creation of the Office of Multicultural Affairs in the early 2000s had a broad vision for it, imagining the office would be proactive in promoting equal access to government services for people of all backgrounds, nationalities and faiths, and ensuring programs were culturally appropriate. The office formed in 2006. “It was supposed to keep a finger to the pulse of what is happening not just with immigrants but also other minority populations in the state, and potentially convene people and say, ‘Hey, we’ve identified an issue, how are you addressing that?’” said Beth Stickney, the former executive director of the Immigrant Legal Advocacy Project, which, along with the NAACP and other groups, lobbied for the creation of the office. But from the start, the office was not adequately funded to live up to its lofty mission, according to several people who interacted with the office in its early days. “It was a token move by the state to look at important issues,” said John Bear Mitchell, a lecturer and coordinator of the Wabanaki Center at the University of Maine who served on a civil rights commission that the multicultural affairs office created soon after it formed. LePage further sidelined the office after he became governor in 2011, said David Slagger, a former Maliseet tribal representative in the Maine Legislature, and others familiar with the work of the office. Today, the Office of Multicultural Affairs has one employee: its director, Julia Trujillo Luengo, who declined to comment on the office’s future. Its website is a testament both to its original vision and also how far it’s veered from it. The calendar has had just one event — drop-in hours for an immigration officer — posted in the last decade. The latest post in the “New and Noteworthy” section of the website is a link to an article from June 2015. “Most of what the office has done has been with resettlement. There’s no outreach to other minorities. They’ve been focused on refugees,” said Regina Phillips, the former coordinator of Portland’s refugee program. As part of its resettlement oversight, the multicultural affairs office has overseen refugee health screenings to make sure every refugee arriving in Maine is checked for infectious diseases upon arrival, collected and reported on data about the origin and numbers of refugees who come to Maine, and served as a conduit between the federal Office of Refugee Resettlement and Catholic Charities. The multicultural office was allotted $116,295 from the state general fund and $1,634,946 from the federal government for fiscal year 2017, which runs July 1, 2016 to June 30, 2017. The state budget indicates the office has two positions. With only one position currently filled, however, it’s not clear how or if the money is being spent. The bulk of the federal funds flow through to Catholic Charities. With Maine state government out of the refugee resettlement picture, the federal Office of Refugee Resettlement will likely designate Catholic Charities to be the “replacement designee” for the state. That would mean Catholic Charities would directly receive federal funds for refugee resettlement, starting in March. Catholic Charities has already applied for the new designation, said Judy Katzel, chief communications and development officer. It’s unclear what effect Trump’s expected executive actions on refugees would have on this process. “Catholic Charities Maine has the capacity and readiness to take over all responsibilities to become this designee,” Katzel said in a written statement. The change is unlikely to have any practical effect on refugees in Maine, according to Sarah Pierce, an associate policy analyst of the research group the Migration Policy Institute. “The whole step of withdrawing is somewhat symbolic and procedural. It shouldn’t change much,” Pierce said. Yet immigrant advocates say the symbol is important. “To be making a statement that we as a state aren’t going to focus on refugee issues is a shame. It’s an important role to be taking a public stance on it,” said Sue Roche, executive director of the Immigrant Legal Advocacy Project. It’s possible the transition could cause confusion and lead to gaps in service, said Pierce of the Migration Policy Institute. “But it would likely affect the nonprofit organization more than the refugees themselves,” she added. Katzel, of Catholic Charities, said the organization is working to prevent such confusion. “Catholic Charities is working closely with the Office of Refugee Resettlement and other partners to ensure a continuum of care across programs in the transition from state to agency oversight, with no anticipated disruption of the delivery of benefits and services in the state of Maine,” she said.